same time, damage the mesh and the printing edge of the squeegee blade profile. Basically, the squeegee action must be released only after the grippers have passed - but fast enough to not lose too big of a print start margin. Traditionally a mechanical system in the form of a cam, synchronised with the motion of the cylinder, is used. However, as machines got faster, the drawback of this widely used system became apparent, mainly leading to vibrations during the first 3 cm of the print and resulting in screen damage, caused by the squeegee coming down on top of the cylinder grippers. In cam controlled systems, the downwards movement of the squeegee bar begins above the grippers on account of the turning point of the movement and ends around 15 mm after this. Under high-speed conditions this however means that the squeegee pushes down the mesh, scratching the top side of the underlying grippers (fig. 1). At even higher running speed, the squeegee actually will set down on the gripper tops. Another problem is caused by the physical influences on the roller following the squeegee drive cam itself. During the downwards movement of the squeegee (i.e. at print start), the cam control causes a very fast and sudden movement of the cam roller which transmits a certain number of vibrations to the squeegee printing edge (fig.1, fig. 2). These two major problems were solved by SPS® engineers, using the unique technology of the hydro-pneumatic SPS® PEH squeegee bridge. Also this completely autonomous system is synchronised with the machine - but not by means of a mechanical connection. Using a combination of pneumatic/hydraulic actuators for the downward movement of the squeegee bar enables a perfect fine-tuning of the set-down movement. Both timing and speed can be adjusted to demand, without the restrictions otherwise given by the interdependency between cylinder drive mechanics and squeegee movement. The first step of the squeegee set-down sequence is activated at the turning point of the screen carrier. At this point, there is still sufficient time for the squeegee to smoothly approach the stencil, just “kissing” the mesh, keeping good clearance to the grippers. Then, once the SPS® STOP cylinder starts to rotate, the second downward step is activated, bringing the squeegee in touch with the substrate positioned on the cylinder – right behind the grippers. 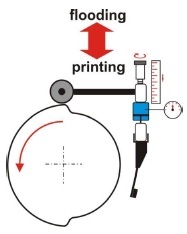 This important second step, initiating the actual print start, is electronically synchronized with the print cylinder rotation, this way constantly controlling the gripper margin set by the operator and keeping it in the closest tolerance (fig. 3). As soon as the squeegee comes down on the cylinder surface it transmits the internal pressure built up in the system to the screen – strong and defined, not influenced by any fluctuations. The pneumatic-hydraulic tandem drive causes the actuators to softly swim back into a non-compressible hydraulic buffer, floating around a medium height position, with exact pressure control. Setting the squeegee pressure and maintaining it constant during the run is independent from squeegee height adjustment. As long as the squeegee level is kept within the range of the hydraulic damping cushion (i.e. within some 2 - 3 mm tolerance) the actual printing pressure is system-controlled, combined with a manometer or digital pressure read out. The operator defines the pace; the automatic system will the do the rest. 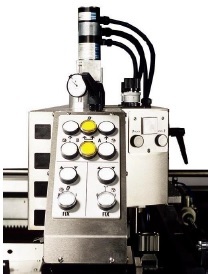 Using this unique squeegee control system provides even more flexibility: the starting point of the print is variable, changing gripper margins can be set to requirement. Depending on the model within the SPS® STOP cylinder range, also a variable squeegee active path length can be pre-selected. - The two-sided fully automatic motorized height setting of the squeegee results in perfect parallelism between printing edge and cylinder whenever the system is set to go after changing the squeegee blade - fully independent of operator skills. The system is fast, accurate and it reduces wear of the squeegee rubber during the print run (fig. 4). 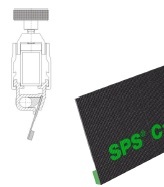 The SPS® C05™ squeegee blade (exclusively made by RKS for SPS®) is a high-tech combination of a carbon fiber back blade and a resistant squeegee rubber edge in selected quality. The stability of the carbon back supports the control of the active squeegee printing angle. In combination with the SPS® PEH squeegee bridge this will result in outstanding print definition, particularly with fine lines and halftone dots (fig. 5). If needed, the operator-friendly pneumatic holder can be easily exchanged for a standard squeegee profile.